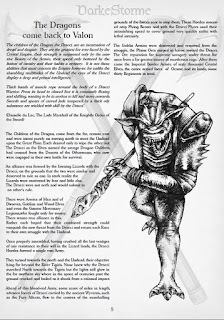 “The Battles of ‘The Darke Age’ are fought in all places of Valon to a differing extent. From isolated groups separated from their Army fighting individual duels and skirmishes, to larger formations separated a great distance from others of their own Race waging private warfare in an effort to return to where they came from. Others still serve as Free Companies, Mercenaries fighting for pay and shelter. The Dracci Hordes and Undead Legions are everywhere clashing not only with each other but also with those who happen to be in their path. 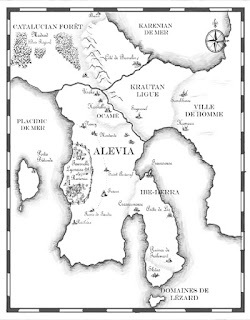 Now the storm of the conflict has focused on Alevia, the region of the Central Continent that by misfortune of geography is the path both north and south between the Placidic and Karenian seas. Alevia was once a full Colony of the Crystal Empire. It borders with the outer Provinces of the High Elves and with the lands held by the Dwarves to the edge of the countless trees that form the Catalucian Forest of the Wood Elves. Alevia is not now what it once was, the fair green fields of wheat and fat grazing animals, winding tracks and villages have now been replaced by churned heaped mires of decomposing bodies. 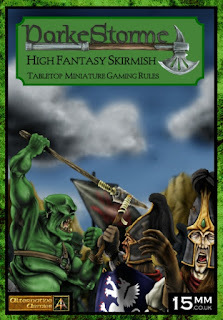 We have a great high fantasy skirmish game system at Alternative Armies which we do not often speak about. 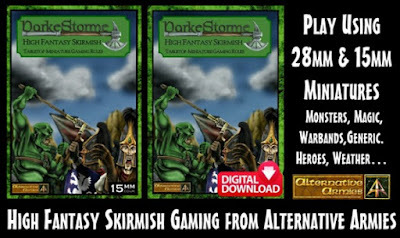 It is called DarkeStorme and it is great fun using any miniatures you might have in your collection in 28mm or 15mm scale. Create a warband, create a hero and a magician from a great number of different races and then seek out adventure. Monsters and more. We have a 20% off offer on the book and on its digital download version too which lasts until Monday 7th January 2019 for you to enjoy. Go HERE or read on for more. Monster Handling system with ‘Amok’ rules. A game system suitable for younger gamers, those with less time or starting out or those looking for an easy play wargame with a traditional high fantasy feel from the era of the 1980’s and 1990’s. Go HERE for the print book and HERE for the digital download. When you decide to play a game of DarkeStorme you will need to decide which scale of miniature you are going to use in play. 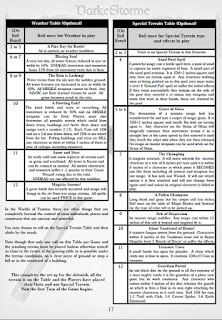 This set of rules caters for 28mm scale and also 15mm scale fantasy miniatures. The book is laid out ASSUMING you are using 28mm scale miniatures in your games and gives all ranges and rates of movement etc in INCHES. Use inches for 28mm scale play. If you are playing with 15mm scale miniatures then transposing the mechanics of play is very simple. All rules remain the same unless otherwise noted and all movement rates and ranges etc given in the book as inches are changed to the same distance in CENTIMETRES. We have a very large selection of miniatures which can be used in this game on our website. Here is a list of the pages just have a browse to see what you like. 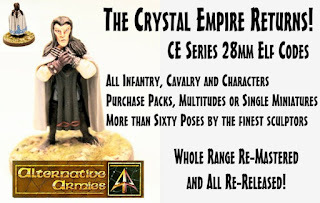 You can purchase single 28mm or packs and packs or sampler small in 15mm scale. We have a whole load of free material for our game systems which can be seen on our FREE DOWNLOADS page and this includes Darkestorme. There is a folder of blank rosters and sheets and beginners scenarios. There is also a free mini-arc campaign called ‘Murder at Illstadde’ to download as well. To make this easier for you here are the links direct to our website storage to download the free DarkeStorme files. Click HERE for the folder and HERE for the mini-arc campaign. Enjoy! 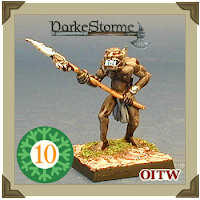 Lastly there is a brand new free adventure for DarkeStorme just published on Orcs in the Webbe as Day 10 of its advent calendar of fun! Counting Coup by Anonymous Bosch a two player scenario all about a young orc. Enjoy and go HERE. I love old school fantasy gaming. Check out the recent blog article ‘Armoured Goblins on the March’ for more on this and these are coming next year. « HERE’S NEGAN: THE BOARD GAME IN STORES NOW!